Was on BBC this morning….was asked to discuss BRICS…. Ques 1 – China will dominate BRICS because of its money and might? Ques 2 – How will India counter China at the BRICS? Ques 3 – How can this group work together without common ideology (or something like that)? Was at my charming best while basically saying…China will be an important player in any grouping – why only BRICS….the questions are posed incorrectly…BRICS is not a platform for India countering China….it is indeed an opportunity to take the edge of the bilateral …..and some people do not see common ideology as being necessary…. (this Euro Centric fetish for “Common Humanity”) and with our individual and rich experiences we can find ways to developing pathways (unique) for an equitable and prosperous future…. Synergy and Complimentarity are the operative words and BRICS are rich with these possibilities. For some in India as well – it is all a zero sum game….maybe it is …but they need to know the rules of arithmetic are changing and the nation state may not be the unit of measurement any more – The BRICS Stock Exchange is the business thumbs up to BRICS and the 4th Academic Forum was the “experts” support to it….many more to follow…. The Political will is expressed in the Delhi Declaration and it is positive, decisive and firm on what the BRICS need to do together and how they need to interact with the developed world on many common issues. I am certain that in this instance the BRICS surprised themselves …..in what they were able to agree to ….In Sanya the BRICS went wider and added South Africa….In Delhi the BRICS went deeper and added substance…. well-being and stability in a responsible and constructive manner. in a multi-polar, inter-dependent and increasingly complex, globalizing world. dimension of our interaction adds to its value and significance. effectiveness in achieving this objective. priority at hand is to restore market confidence and get global growth back on track. ensure strong, sustainable and balanced growth. countries and support the development of emerging and developing economies. significant contributors to global recovery. measures to protect the voice and representation of the IMF’s poorest members. would be considered before the IMF Spring Meeting. lending costs and adopting innovative lending tools. issues and to overcome an outdated donor- recipient dichotomy. us by the next Summit. G20 in 2013 and extend their cooperation. fail to address the development deficit inherited from previous negotiating rounds. strengthen and develop the multilateral trade system. 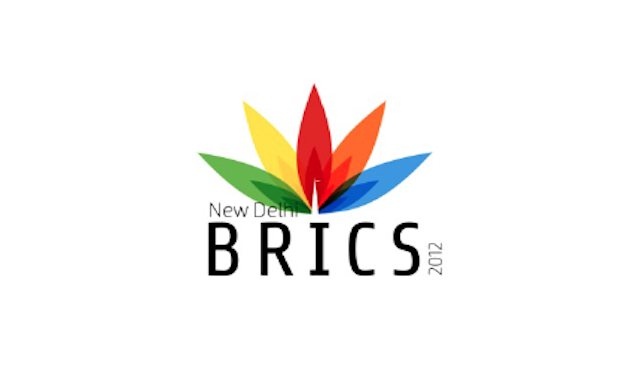 to the achievement of a successful UNCTAD XIII, in April 2012.
for enhancing intra-BRICS trade in coming years. activity in the Occupied Palestinian Territories. we welcome the joint efforts of the United Nations and the Arab League to this end. provisions of the relevant UN Security Council Resolutions. originating in Afghanistan within the framework of the Paris Pact. international affairs and support their aspiration to play a greater role in the UN. security in the years to come. this responsibility to our future generations. implementation of nationally appropriate mitigation actions of developing countries. (GESDPE) as well as Institutional Framework for Sustainable Development (IFSD). host of this important Conference in June, for a successful and practical outcome. Strategic Plan 2011-2020 and the Resource Mobilization Strategy. investment barriers in any form on the grounds of developing green economy. secure source of energy, vital to meeting global energy demands. difference in the quality of lives of the people particularly in the developing world. institutions through joint projects, workshops and exchanges of young scientists. our own, are multi-dimensional in nature covering a diversity of inter-linked issues. released today, serves as a useful reference on BRICS countries. Alliance, a joint initiative by related BRICS securities exchanges. BRICS Summit in 2013 and pledge their full support. well as stand-alone meetings, as required. of Agriculture Expert Working Group. 7. The Second BRICS Senior Officials’ Meeting on S&T. Friendship Cities and Local Governments Cooperation Forum in 2012 in India. environment and climate related international fora, as necessary. If conceptualised carefully, the Bank can help rebalance the global economy leading to equitable and resilient growth. Even as New Delhi prepares for the arrival of BRICS Heads of States towards the later part of the week, media and experts across the world continue to debate the relevance, capacity and cohesiveness of the grouping. The common refrain in the western press is that it is a ‘motley crew’ with little in common and therefore with little capability to create institutions and multilateral platforms of substance. Well, they may be in for a surprise. In fact, BRICS may also surprise itself. Besides the usual declarations on cooperation on political matters, social challenges, climate and energy, food and water, health and education, industry and trade, BRICS is likely to make two significant announcements this time, which will, in many ways, mark its coming of age. First — the formal launch of the “BRICS Exchange Alliance” in which the major stock exchanges of BRICS countries will offer investors index-based derivatives trading options of exchanges in domestic currency. This will allow investors within BRICS to invest in each other’s progress, expand the offerings of the individual exchanges, facilitate greater liquidity, while simultaneously strengthening efforts to deepen financial integration through market-determined mechanisms. From talking to people in the know, this alliance is good to go, and the operational modalities around currency, settlement cycles and inter-exchange regulatory coordination are all issues that have been thought through and resolved. Foremost amongst the reasons for the creation of the institution is the need for BRICS to assume pole position in global financial governance. BRICS nations represent nearly half the world’s population. Two of them are already among the top five economies in purchasing power parity terms, and four are in the top 10. If conceptualised carefully, such an institution will have the potential to reshape and realign the global development agenda positively. It can also help to efficiently redistribute and redirect savings available with the emerging economies to infrastructure and social development in the same regions and, therefore, contribute to the rebalancing of the global economy. Several multilateral banks already exist, that serve as templates for creating a new institution. The World Bank, which is deeply embedded in the global development narratives, serves as a particularly relevant example. If a multilateral BRICS bank is instituted, its functions would not supplant the role of existing multilateral banks that support development, but rather, supplement them. And this supplementary instrument is needed as multilateral banks such as the World Bank, ADB, etc., have not been growing significantly in terms of the total amount of loans disbursed. While there was a jump in disbursals following the financial crisis, the normalisation process is already under way. On the other hand, demand for funds for infrastructure and social transformation grows unabated in BRICS and the developing world. But how would the BRICS Bank work? There are doubts expressed in some quarters on the process of capitalisation itself. The Bank would have to raise capital from open market operations; floating debt to finance lending operations. While the reliance on markets for raising capital would make the fiscal asymmetries within BRICS nations irrelevant, the sovereign ratings of some of the members, who will collectively be the shareholders of a BRICS Bank, are barely investment grade. This would limit the amount of capital that could be raised from the financial markets and also affect the cost of capital and therefore the cost of lending. One suggested solution is the sequestration of a proportion of foreign reserves of BRICS members into a trust fund that would back-stop the borrowed capital. In the case of the World Bank, the total paid-up capital is around 10 per cent while the rest is AAA rated ‘callable capital’, which has never been requisitioned. To enhance the creditworthiness further, existing multilateral banks, and other western countries could also be given minority stakes. The second element that is always embedded in the discussions around the bank is the role of China. An impression is sought to be created that with its massive monetary reserves and political clout, China may exert undue influence in this bank. This is unlikely. Such a bank will not require too much paid-up capital (relative to the average size of respective sovereign reserves) if intelligent financial engineering can help sequester foreign reserves. This would mean that the smallest BRICS economy, South Africa, could easily commit an amount similar to that of China in the capital structure. Such doubts could be further allayed with the institution of a rotating Presidency of, say, a two-year term that could initially be restricted to the BRICS countries alone. In any case, the charter of any modern day banking institution with sovereign stakeholders would need to include the mandates of transparency and independence, which would make the institution as viable as any. The third aspect that remains central to the viability of such a bank is the currency of business. There would be expectations that such a bank would transact in local currencies where possible and in international currency when needed. The bank would need to work with the right currency mix to mitigate credit risk while simultaneously balancing intricate political dynamics within BRICS. For instance, being a current account deficit country, India would not be averse to the U.S. dollar being the currency of disbursal while Brazil with its appreciating “Real’ may prefer local currency. The Chinese may see this bank as a platform for promoting the Renminbi as the currency of choice, especially among the emerging and developing countries. Ultimately, the right mix would need to take into account monetary policy and exchange rate imperatives of each of the primary sovereign stakeholders and in a manner that makes this venture uncomplicated and attractive to other stakeholders as well. The fourth aspect is the business mandate of such a bank. An effective development bank would have to integrate the multiple economic priorities. Key areas such as infrastructure and the medium and small scale enterprises sector could be natural starting points. The Brazilian Development Bank (BNDES) could be considered an exemplar. The BNDES disbursed close to $140 billion in 2011, with around 30 per cent going to the medium to small enterprises sector (MSME) and about 40 per cent going to large infrastructure projects. The BNDES also played a crucial role in stabilising the Brazilian economy after the financial crisis by stepping up development assistance. Similarly, a BRICS Bank could also assume the role of a financial support mechanism which appropriately responds to the variabilities in the global economy. Corporations are the primary growth drivers of BRICS economies. They create economic momentum, new business opportunities and, most importantly, in the context of BRICS, employment. The creation of SPVs to cater to the investment and insurance needs of corporations would therefore complement the development agenda. The World Bank’s International Finance Corporation (IFC) and Multilateral Investment Guarantee Agency (MIGA) provide readymade frameworks. The IFC provides investment solutions for the private sector through services such as equity finance and structured finance, while the MIGA provides non commercial risk insurance guarantees. Guarantees against political risk — which is a significant investment constraint in emerging markets — could facilitate a spurt of new business activity within BRICS, and lest we imagine this instrument to be risk-laden, MIGA has paid only six insurance claims since it was set up in 1988 and needs no counter guarantees. BRICS is in transition and cannot afford to lose growth momentum. Multilateral institutions such as a BRICS Bank can aid in sustaining directed, equitable and resilient growth. A consensus on the creation of such an institution would be a very real expression of intent by BRICS to craft alternative development trajectories to those passed down by the OECD countries. And it is also time to Bank with BRICS. Samir Saran is Vice-President and Vivan Sharan an Associate Fellow at the Observer Research Foundation. The foundation hosted the BRICS Academic Forum in March this year. Meeting His Holiness The Dalai Lama. 1) How will the Tibetan population exist in India post the Dalai Lama and how would the dynamics alter? 2) Will the youth get restless on both sides of the border and which country would bear the brunt – India or China? 3) Even a more democratic China may not mean reintegration for the Tibetans in India? 4) How does it feel to be a nation without real estate? 5) How does he still smile while recounting his story? Perhaps these are old posers….perhaps they still need to be understood…perhaps they never will be…. 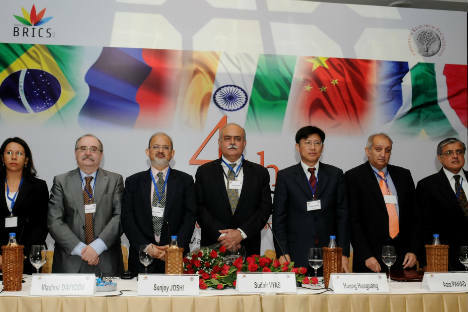 The 4th BRICS Academic Forum recently concluded in New Delhi. Over 60 delegates representing academic institutions, think tanks and expert community from the member countries participated in substantial debates that covered virtually every challenge and opportunity of contemporary times. The debates were intense, sometimes combative but almost always conducted among friends. This was the key takeaway from this meeting. The community is strong, it is aware of the differences, eager to resolve those and is comfortable with the irresolvables. The skeptics of BRICS for four years, would now need to rethink, this group has evolved, this group sees potential in greater and deeper engagement, and this group is capable of proposing bold and visionary ideas at the New Delhi Summit later this month and in the other interactions before and after. This was not always the case and we only have to recall the early days of the relationship. To anyone witnessing one of the early Track 2 interactions on a cold day in Moscow in 2008, it would have seemed improbable that the grouping would come this far. There was early hesitance and unformed agendas among each of the experts gathered from the four countries (at that time BRIC). The Brazilian experts were unsure of their being there in the first place. A very prominent diplomat from Brazil saying, “why are we here, why do you need us, you are all neighbours and should talk amongst yourselves”. The Russians at that time, and who must be credited for the inception of the BRIC idea, saw in it a political opportunity to create a grouping of that could counter the Atlantic alliance and the Western economic and political weight. They were to be dissappointed, India and China were already deeply integrated with the US and EU in the arena of trade and economics and would not play ball. The experts from China liked the BRIC idea, which could be another instrument for projecting their growing pole position in world affairs and India was beginning to manage the nuances of diverse relationships in multi-polar world. It had also learnt from the SCO experience and this time it would not demur. However, the early days of the conversations amongst experts and indeed among the policy makers from these countries lacked detail. This has changed, from the macro discussions on global governance, financial architecture, security and greater coordination, the discussions today focus on the substantive, on experince sharing, on creating institutions and linking up existing ones. 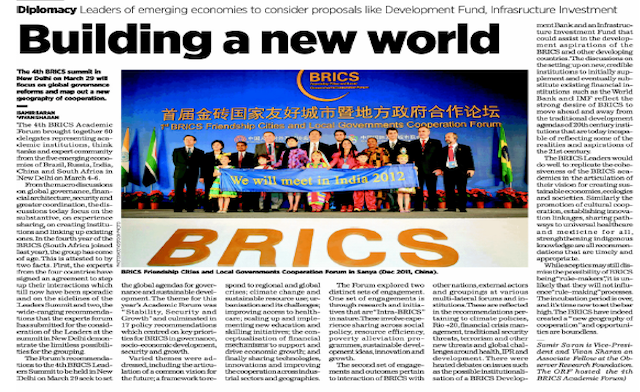 In the fourth year of the BRICS (South Africa joined last year), the group has come of age. This is attested to by two facts. First, the experts from the four countries have signed an agreement to step up their interactions which till now have been sporadic and on the sidelines of the Leaders Summit and two, the wide ranging recommendations that the experts forum has submitted for the consideration of the Leaders at the summit in New Delhi demonstrate the limitless possibilities for the grouping. The Forum’s recommendations to the 4th BRICS Leaders Summit to be held in New Delhi on March 29th are relevant and actionable. They are the result of intense discussions, debates and negotiations between the delegates on common challenges and opportunities faced by BRICS members, as they seek to set the global agendas for governance and development going forward. The theme for this year’s Academic Forum was “Stability, Security and Growth” – all common imperatives for the emerging and developing BRICS nations. 17 policy recommendations were carefully crafted by the Forum and are centred on key priorities for BRICS within the aegis of governance, socio-economic development, security and growth. The mandate of the Forum was to provide concrete policy alternatives to BRICS Leaders and to the credit of the delegates this year, the recommendations may have lived up to the mandate. The Forum deliberated context specific micro debates embedded within larger narratives. Varied and significant themes were addressed including the articulation of a common vision for the future; a framework to respond to regional and global crises; climate change and sustainable resource use; urbanization and its associated challenges; improving access to healthcare at all levels; scaling up and implementing new education and skilling initiatives; the conceptualization of financial mechanisms to support and drive economic growth; and finally sharing technologies, innovations and improving the cooperation across industrial sectors and geographies. The Forum deliberated upon two distinct sets of engagement. One set of engagements is through research and initiatives that are “Intra-BRICS” in nature. These involve experience sharing across social policy, resource efficiency, poverty alleviation programmes, sustainable development ideas, innovation and growth. Each of these themes can be effectively mapped to help tailor policy within BRICS. The recommendations highlight the possibilities for enhancing such engagements through exchange of institutional experiences and processes, free flow of scholars and students, joint policy research, capacity and capability building for facilitating such interactions. The second set of engagements and outcomes pertain to interaction of BRICS with other nations, external actors and groupings at various multi-lateral forums and institutions. These are reflected in the recommendations pertaining to climate policies, Rio +20, financial crisis management, traditional security threats, terrorism and other new threats and global challenges around health, IPR and development. The Forum provided a valuable platform for exchange of perspectives between delegates without adhering to national positions or party loyalties. There were heated debates on issues such as the possible institutionalisation of a BRICS Development Bank and an Infrastructure Investment Fund that could assist in the development aspirations of the BRICS and other developing countries. The discussions on the setting up on new, credible institutions to initially supplement and eventually substitute existing financial institutions such as the World Bank and IMF reflect the strong desire of BRICS to move ahead and away from the traditional development agendas of 20th century institutions that are today incapable of empathising with some of the realities and aspirations of the 21st century. This is perhaps a reflection on the way Bretton Woods Institutions are managed and governed and indeed to their legitimacy itself. The recommendations reveal that BRICS view the sustainable development agenda through the lens of inclusive growth and equitable development primarily. The recommendations have also clarified that BRICS will continue to focus on achieving efficiency gains in resource use. Both these outcomes point towards resolute and far sighted policy guidance by the Forum. Climate change mitigation debates which have become a proxy for “Promoting Green Technology” and indeed are an outcome of “re-industrialisation policy” of some EU countries were conspicuous by their absence from the debates. Instead, with “plurality in prosperity” as a common ideal, the outcomes also signify that the research community within BRICS want the sustainability discourse to shift from one that emphasises common responsibility to one that emphasises common prosperity. This means that BRICS must attempt to reorient consumption patterns and energy use globally, towards sustainable trajectories. The BRICS Leaders would do well to replicate the cohesiveness of the BRICS academics in the articulation of their vision for creating sustainable economies, ecologies and societies. Similarly the promotion of cultural cooperation, establishing innovation linkages, sharing pathways to universal healthcare and medicine for all, strenghthening indigenous knowledge are all recommendations that are timely and appropriate. The gradual transition process of BRICS becoming the global agenda setters has been one of the more exciting developments to watch and study. While sceptics may still dismiss the possibility of BRICS being “rule-makers”, it is unlikely that they will not influence “rule-making” processes. The experts at the forum were unambiguous in their vision for the grouping. While recognising that in many instances BRICS might eventually yield to sub optimal policy formulations due to national agendas and geo-political constraints, they were determined that the incubation period is over and now the bar must always be set high and the leaders must be ambitious. In the words of one of the delegates at the 4th BRICS Academic Forum, BRICS have indeed created a “new geography of cooperation” and opportunities are boundless. Samir Saran is Vice-President and Vivan Sharan an Associate Fellow at the Observer Research Foundation. The foundation hosted the 4th BRICS Academic Forum. Connecting climate change with security will defeat democracy in developing nations, said climate experts at a roundtable conference in New Delhi. New Delhi: Linking climate change and conflict is not new. Even in the 70s, Western scholars like Richard Falk and Lester Brown started talking about the relation between environment and security. Environmental refugees and, wars over depleting resources became a common topic to talk about in the post Cold War period. It was an initiation to securitise climate change and other environmental issues. Scholar Ole Waever had said, “Something becomes successfully securitised when it is cast as an existential threat that justifies an extraordinary (usually military) response.” On and off, climate change is being observed as a bigger threat to security than nondemocratic regimes, relative power and a conflict-ridden history, that can act as an ‘excuse’ for military response, fear experts. Climate change is a serious issue that requires consideration to ensure water, energy and food security, particularly in the South Asian region, but it should not be seen as a basis that will lead to security dilemmas, asserted panellists at a roundtable discussion, ‘India’s vulnerability to climate change: The security implication’, organised by the Observer Research Foundation (ORF) on February 15, 2012 in New Delhi. “We live in globalised world. We are interconnected. 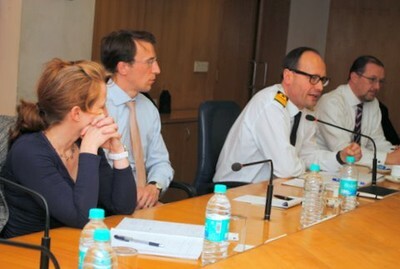 What happens in one part affects us,” said Admiral Neil Morisetti, UK envoy on Climate and Energy Security. He cited the growing perception of ‘climate change as a stress multiplier’ amongst the Western world and endorsed the idea of incorporating international perspectives on climate issues in the national security strategies. Highlighting the reasons behind the success of the Indus Water Treaty between India and Pakistan, Ramaswamy Iyer, Former Secretary, Ministry of Water Resources said, “Despite wars, nothing has happened to the Indus Water Treaty because it’s a simple treaty and has been insulated from political and military interferences.” Citing examples from the treaty, Iyer denounced the idea of securitisation of climate change and the implications of giving a ‘security angle’ to key issues related to environment and natural resources management. “Melting ice is not as big a problem for India, as sinking rivers is,” said Mukul Sanwal, former coordinator UNFCCC. Sanwal presented a different perspective over traditional ways of evaluating climate change impacts. According to him, elements of societal change, growing Asian markets and changing trade routes should be taken into account while carrying out climate change assessments. He also emphasised that climate change might encourage countries for greater cooperation rather than act as a threat multiplier. 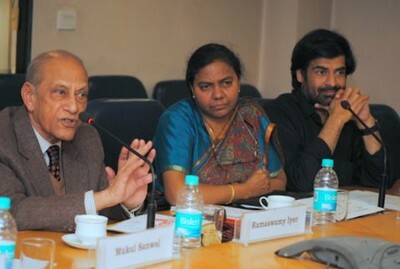 Samir Saran, Vice President, ORF, recommended that in order to disconnect security and climate change, research and development on climate change should not be carried out with defence institutions. He added that additional grants to security divisions are unnecessary when it comes to tackling climate change. Developing nations already have a strong military presence and securitising environmental issues would defeat democracy in such regions. Therefore, de-securitisation of climate change is imperative for peaceful relations between the countries. The BSE-GREENEX is designed to promote ‘green’ investing mindset among investors and assesses corporate on quantitative metrics for carbon performance. Mumbai – Indian markets witnessed the launch of the first-ever live carbon index, BSE-GREENEX, at the hands of Dr. (Shri) M. Veerappa Moily, Hon’ble Minister of Corporate Affairs, Government of India at BSE on February 22. BSE Ltd. (Formerly Bombay Stock Exchange Ltd.) in association with gTrade (supported by GIZ) and promoted byFederal Republic of Germany, Observer Research Foundation and IIM Ahmedabad) has constructed BSE-GREENEX – designed specifically to promote green investing, with emphasis on financial performance and long term viability of companies. It is based upon purely quantitative and objective performance signals to assess carbon performance. BSE-GREENEX includes top 20 companies based on greenhouse gas numbers, free float market capitalization and turnover. In keeping with BSE’s efforts to create fund friendly Indices, it is the third Index which is calculated based on the capping methodology. This Index will be helpful to asset managers for creation of various products, to help investors to invest in the green theme of India. BSE-GREENEX is expected to have a feedback effect on companies’ reputation. It will help the Government to gauge policy implementation and acceptance with regard to energy usage and efficiency measures, as the market follows an efficient signaling mechanism which adjusts positively or negatively to any news/policy shifts. Shri Rajiv Agarwal, whole time member, SEBI (Securities and Exchange Board of India), Shri Sunjoy Joshi, Director, ORF (Observer Research Foundation), Prof. (Shri) Amit Garg, IIM Ahmedabad and Shri Samir Saran, Chairman, gTrade, were also present at the launch and spoke on the subject. March 06, 2012, New Delhi: The 4th BRICS Academic Forum comprising experts and scholars from the research and academic institutions of Brazil, Russia, India, China and South Africa met on March 4th, 5th and 6th, 2012 in New Delhi. Given that the BRICS have covered significant ground from the first meeting of Leaders in Yekaterinburg, the Forum believes that they must seek and set concrete agendas for articulating a clear, bold and ambitious vision. The theme for this year’s Forum, “Stability, Security and Growth”, represents the common aspirations of BRICS for strengthening progressive development trajectories and seeking transformations for optimal representation and participation in matters of global political, economic and financial governance. Sovereignity and International law serve as the fundamental principles for BRICS members in world affairs and these are prerequisites for ensuring stability, security and growth. The imperative of economic growth cannot be substituted, and the Forum believes that BRICS must continue to create synergies for enhancing this growth through greater engagement with one another as well as with the rest of the world. 1) Given the state of the euro zone and the continued ripples created by the global financial crisis, greater emphasis must be given to creating frameworks for enabling viable and timely responses to both endogenous and exogenous financial shocks within and outside BRICS. To this end, a systematic approach must be articulated to respond to any further economic downturns in the global economy. 2) The BRICS nations must seek to create institutions that enable viable alternatives for enhancing inclusive socio-economic development agenda within and outside BRICS. Such institutions must eventually seek to set global benchmarks for best practices and standards. 3) BRICS agreed to “strengthen financial cooperation” among their individual development banks at the Leaders Summit at Sanya in 2011. For furthering this objective, the Forum recommends studying the establishment and operational modalities of financial institutions such as a Development Bank and/or an Investment Fund that can assist in the development of BRICS and other developing countries. 4) BRICS must evolve as a platform for creating contextualised multilateral policies, and by mutual consultation develop viable and credible mechanisms to respond to local, regional and international political and social turbulence such as the events being witnessed in West Asia and North Africa. 5) The increasing involvement of non state actors and the dilution of the principle of non-interference are dual challenges that need to be met. Appropriate policies consistent with International Law need be be studied by BRICS academic institutions. 6) The BRICS are home to some of the most bio-diverse regions in the world and they must work together to preserve such diversity through exchanges and consultations. They also must share experiences of integrating natural assets with their national macro-economic policies. 7) As home to nearly half of the world’s population, BRICS have a responsibility to create pathways for sustainable development. BRICS could learn from policy successes as well as failures of the past from within and outside BRICS, and seek to implement policy solutions for sustainable development. In this context BRICS must bring to the fore inclusive growth and equitable development as the central narrative at global fora such as Rio+20. 8) BRICS must study the role of financial and non-financial policy instruments in promoting innovation, strengthening University-Industry linkages and evolving TRIPS compatible IPR policies. 9) The BRICS nations have a responsibility to respond to the increase in terrorist activities, illicit narcotics trade, money laundering, human trafficking and other new challenges. They must work together to neutralise the threats posed to each of them by sharing resources and information where appropriate, and through collaboration between relevant institutions in the member countries. 10) The Forum noted that a website has already been created by the Indian coordinator on BRICS issues. This could be further evolved into a virtual platform for the academic community for dissemination of developments, research and ideas. The Forum also suggests that the academic community and governments must work towards enhancing visibility of BRICS in their own countries and create an identifiable brand value. 11) Recent trends have shown that the BRICS are still very vulnerable to food and commodity price volatility. This, in turn, has exposed gaps in existing market policies and regulations as well as highlighted the imperative of resource efficiency. The BRICS should increase intra-BRICS cooperation in order to provide stable economic anchors for price volatility while simultaneously enhancing efficiency of resource use through better management, standards and technologies. 12) Urbanization is both a common challenge and an opportunity for BRICS. Additional capability and capacity building within urban agglomerations must be prioritized through sharing knowledge, policies and skills. Key actionable areas need to include infrastructure development, investments in mass transport, and programmes to enable social transformation. 13) The BRICS members must study the efficacy of their individual education policies and policies on Affirmative Action in promoting Inclusive growth. Documenting and sharing related outcomes could prove mutually beneficial. As a first step each of the member countries could use the Internet-based platform for distance learning about one another’s history and socio-economic development. 14) Cultural cooperation and connectivity between BRICS countries should be promoted. Instituting scholarships to promote student exchange between BRICS and creation of platform for dialogue and interface between representatives from legislative bodies, political parties and young leaders of the member nations could complement such efforts. 15) The BRICS are replete with instances and examples of innovative technologies, policies and practices. They must create linkages and institutions to share such learning, in order to promote economic growth and human development. An exchange programme of scholars, experts and business leaders in the area of innovation and entrepreneurship would present a good opportunity to enable this. In this context diversified linkages could be established among the business schools and other institutions of the five countries. 16) BRICS experts must undertake a thorough assessment of indigenous knowledge and practices to deal with common challenges such as eco-friendly agricultural practices, efficient water use, disaster management and other humanitarian issues. 17) BRICS need to collaborate on the realization of the ideal of ‘universal healthcare and medicines for all’. They must enable sharing of policies, practices, standards and experiences on public healthcare and create a community of healthcare professionals across BRICS. It is also suggested that the members must collaborate in strengthening the understanding and dissemination of traditional medicines and therapeutic practices. BRICS members must also coordinate and cooperate in international fora such as the WTO and work towards the effective transformation of WHO programmes. The BRICS academic institutions and governments must share their hosting experiences from the annual Academic Forums and Summits in order to make successive interactions more productive and efficient. BRICS engagements must be increased in range and frequency. To this end a Memorandum of Understanding has been signed between BRICS coordinating research institutions. BRICS must explore and make use of such avenues and partnerships among member countries. The BRICS Academic Forum wishes the Indian government the very best for hosting the 4th BRICS Leaders Summit and is confident that the Forum’s recommendations will be considered. The Forum appreciates the warm hospitality and expresses a hearty thank you to the Observer Research Foundation for all arrangements. The Forum looks forward to the next meeting of academics in 2013, to be held in South Africa and they will continue their active engagement and offer full support to the organisers. to cooperate, share and work together. regions, communities and security of development space and the environment. economies, capabilities and the daily lives of their peoples. demand urgent attention. These themes are reflected in the agenda.